Argentineans have a fantastic story about the origins of dulce de leche. They claim that in a war, in their country, in the early nineteenth century, on a winter afternoon, General Lavalle and General Manuel de Rosas came together in order to make a treaty. The General Lavalle arrived very tired at the camp of General Manuel de Rosas. Manuel de Rosas wasn’t in the camp at the moment so General Lavalle entered into his tent and took a nap. While the General Lavalle was napping a serving woman was preparing “la lechada” for the camp. “La lechada” is prepared by heating sugar and milk. The woman went to speak with the General Manuel de Rosas in his tent, but when she entered she discovered the enemy. She didn’t know about the treaty the two generals were about to make, so she ran to find soldiers. When she remembered and checked on “la lechada,” she noticed that it had become a dark brown jelly substance. It is said that a very brave and hungry soldier tried the jelly and then dulce de leche was born. It’s a great story, but others claim that it dulce de leche most likely originated with the French “confiture de lait”, a confections very similar to dulce de leche that was created - coincidentally? - in the fourteenth century in a similar military culinary accident. I really don’t care where it came from. Dulce de leche is the STUFF. What I can say, is that you can pretty much find the stuff in any Latin America country, the only thing that changes is the name. In Argentina, Uruguay, Bolivia, Paraguay and Costa Rica, Venezuela it’s Dulce de Leche; in Chile, Ecuador and Panama it is known as Manjar; in Peru and Colombia it’s either as Manjar Blanco or arequipe depending on regional variations; in Mexico, Cajeta; and in Brazil it is known by its Portuguese name doce de leite. Whatever you may want to call it, I been lucky enough to travel most of Latin America and try it all, but, this sweet stuff is specially popular in Argentina, which is put into EVERYTHING. Cakes, breads, cookies, ice cream and so much more, the possibilities are endless. I love the stuff, but then I’m also a huge fan of sweet condensed milk, so its no surprise that if something has dulce de leche, I’m going to dig in. So, when I visited Argentina again two years ago, I was pretty much in high dulce de leche heaven. Every single “pasteleria” (bakery) had a different version of cake made with it. 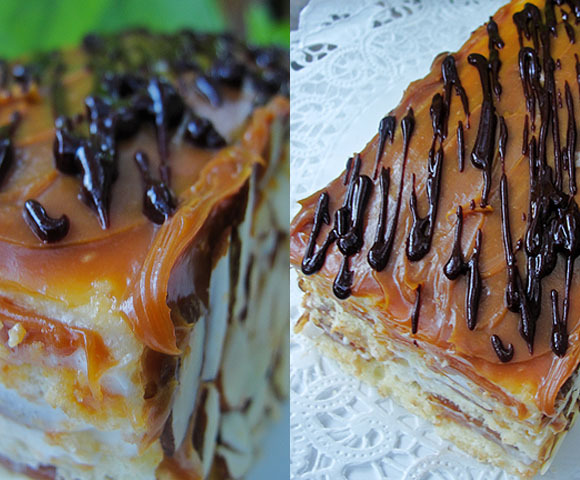 But, nothing called my name more than the “Arrollado con dulce de leche” - which is basically a dulce de leche roll. 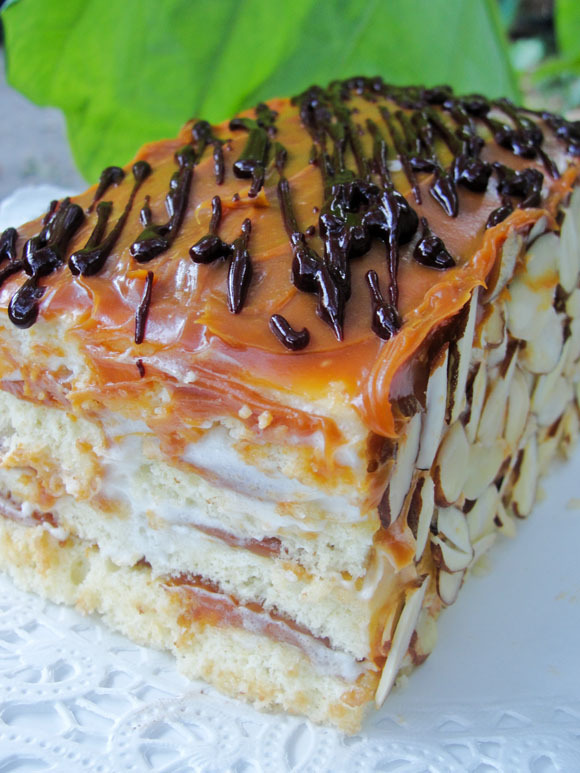 A cake, baked in a jelly roll pan, soaked with rum and topped with dulce de leche first and then whipped sweet cream and then roll into itself. Then topped again with dulce de leche and dark chocolate swirls. But, wait.. you guys are probably looking all over this post looking for the roll… because seriously? what roll? - the picture above is not a roll - that is a cake. Or something like a cake. But, a roll? is NOT. See folks that call going to plan B, when plan A fails and you need to make it work. And made it work I did. Apparently, I seem to be having issues with my baking pans. I’m totally convince that my ruler is laying to me, because after I made the roll batter and spread it on my 11x15x1 pan, the whole thing baked, but when I tried to “roll” the cake, it started to break on me. Apparently the cake was not “flat” enough sort of when this happen. Since the dulce de leche and whipped cream were already spread on the roll by this time, I was not going to loose it. So, I decided to go square. And ended up with cutting the roll into equal rectangular parts and stacking it on top of each other to end up with the same thing principle, but different look. Tim Gunn would be proud - no way was I going to be Auf Wiedersehen for this. I’m going to give you the recipe and the instructions to actually make the ROLL, but if you want to go my route just do the above. I little bit of a warning this dessert is SWEET.. so if you don’t like sweet, skip it. But, I can tell you that the flavor does mellow out the second/third day - if it even last long. Preheat the oven to 350F. Line a 11-by 15-by 1-inch jelly roll pan with parchment paper cut lightly bigger than the tray. Butter & flour the parchment paper or spray it with baking spray. In a medium size bowl, beat the egg whites in a large bowl with a mixer until foamy. Add the sugar and beat until stiff, glossy peaks form. Beat in the egg yolks, one at a time. Continue beating 7 to 10 minutes, until the batter is thick and creamy. Fold the milk mixture into the egg mixture, alternating with the flour. Pour the batter into the prepare pan. Bake for 15 to 20 minutes, or until the cake springs back when touched or a tester in the center comes out clean. Let it cool in it’s pan for 5 minutes. Whip cream until almost stiff. Add sugar and vanilla; beat until cream holds peaks, place in the refrigerator until ready to assemble the cake. While it’s still warm, transfer the cake, still on the parchment, to a work surface. Brush rum evenly over the cake and sprinkle with confectioner’s sugar. Holding the long end of the paper, start rolling the cake toward you, peeling the paper away as you roll. When you rolled up the entired cake, roll the paper around it to secure, and let cool. When the cake is cool, remove the paper and unroll the cake, Spread half of the dulce de leche evenly over the cake, followed by the whipped cream. Re-roll the cake as above. Place the roll on a serving platter, seams side down. Use the rest of the dulce de leche to cover the roll all around. Take the melted chocolate and use it to decorate the cake by dipping a fork and moving it back an forth to create a patter on top. Then the sides with the toasted almonds pieces. Don’t omit the rum soaking if you can help it. 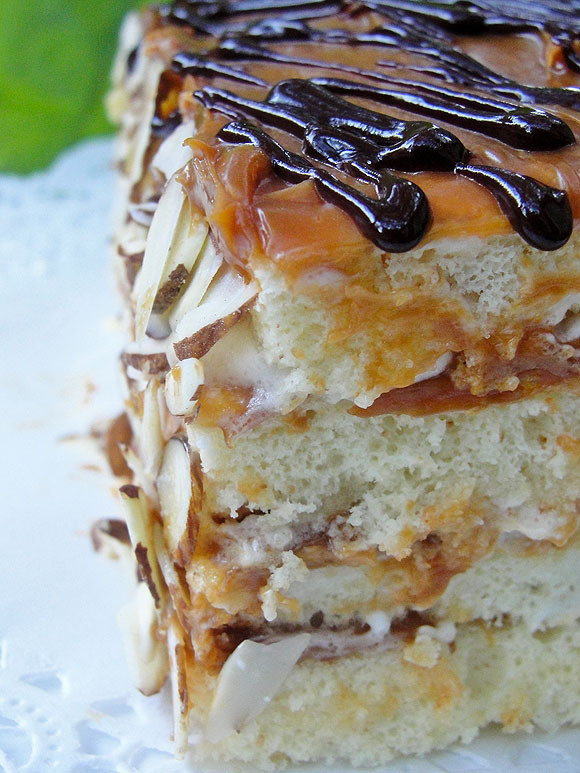 This cuts down the the sweetness of the dulce de leche and keeps the cake moist. If you cannot find dulce de leche in your locar supermarket, you can make your own. I found that David Lebovitz has a great one and you can get it here. As mentioned before if you want to go the stacked route - cut the cake into equal parts rectangular and frost each piece and stack, then cover the whole thing with dulce de leche and decorate the same. You don’t have to cover the roll with dulce de leche, you can leave it plain and just dust it with a bit of confectioner’s sugar to give it more of a rustic look. Leftover can be placed in the refrigerator, make sure you cover it with plastic wrap so it will not dry out. This is best eaten at room temperature, so make sure to take it out and let it sit for at least 30 minutes before serving it.